Ah, the love of my life (well, one of them!). I wanted a Porsche for a long time -- and finally bought one at the end of 1994 (with a lot of help from the nice people at the bank!). It was a great car... until last year when I bought an even better 1991 944 Turbo (with even more help from the nice people at the bank). 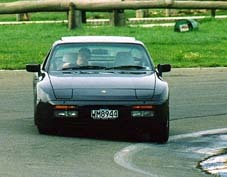 If you see on New Zealand roads a Panther Black 944T (a really dark charcoal metallic) it's probably me. 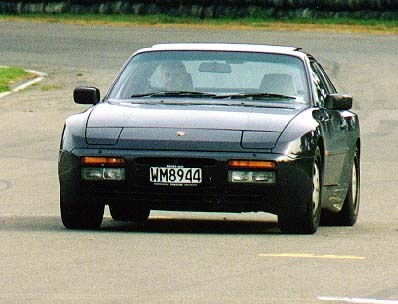 Keen Porsche fans in New Zealand should consider joining the Porsche Club of New Zealand. If getting your car onto the race track (with little danger of harming either it or you -- the two pics of my car here were taken on the Manfeild circuit at driver training... don't have any of me in the sprints though, darn it... I was really flying then! ), partaking in driver training days, or trying to avoid cones at motorkhanas, sounds like fun, then you can e-mail me for info. Oh yeah, it's not all petrol -- there's a good club social side too. I'll drink to that! A good site for meeting Porsche owners and discussing the joys (and ocassional pitfalls) of owning the world's best car is RennList. You'll find me on and the other water-pumpers on the 924-944 mail list.